The Cost Of Energy Is Expensive. So Is Your Time. Rising fuel costs have forced energy management to the forefront of every building manager’s agenda. HVAC makes up between 30% and 60% of an energy budget followed closely by lighting (Figure 1). Start saving time, money and energy immediately with the Net/X™ HVAC Energy Management System. Net/X™ systems get your HVAC equipment under control, providing point-n-click control of schedules, commercial lockouts to keep schedules operating properly, and a suite of tools to help manage your environment. These powerful solutions will allow you to save staff time and substantial utility dollars by saving energy. For over 20 years, Network Thermostat has been a pioneer in communicating thermostat technologies, and our experience over the decades will deliver comfort and energy savings for years to come. When your installation is complete, you can rest assured that you will have optimal comfort when occupied, and dramatic energy savings when not. Figure 1. 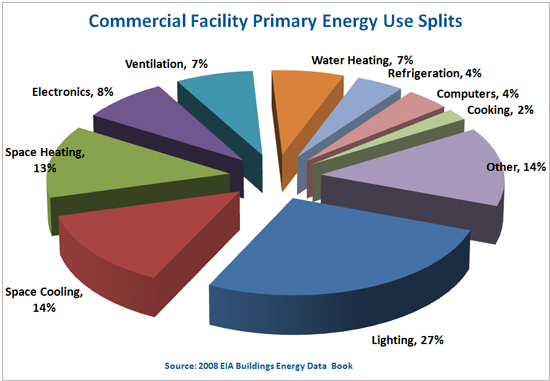 Breakdown of Office Building Energy Use. Triple Green HVAC control solutions from NetworkThermostat can save time, save energy and save money. 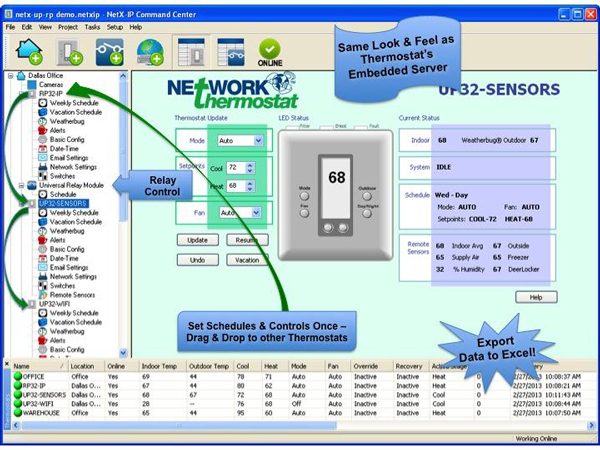 NetworkThermostat offers an “energy management system in a box”. Use any Net/X solution for standard Gas/Electric/Oil systems up to 2-heat/2-cool, Heat Pump systems up to 3-heat/2-cool or Universal All-in-1 Gas/Electric/Oil/Heat Pump systems. This HVAC Control solution provides risk management through reduced energy costs, reduced user tampering, improved comfort, proactive repair and preventive maintenance, reduced labor costs, and improved scheduling flexibility. A standard programmable thermostat has an over-used and much abused vacation hold button. Too frequently the vacation hold is set and never reset back to the programmed schedule. NetworkThermostat eliminates this reset necessity by requiring a return date before the vacation override can be activated. Standard programmable thermostats also require lock boxes to prevent set point tampering. The Net/X control systems provide two methods of electronic lockout or the flexibility to allow a regulated override for a pre-determined time. Using a NetworkThermostat energy management solution saves wear and tear on HVAC equipment through active and proactive service alerts. These alerts include filter changes, excessive heat/excessive cold, inefficient equipment runs and condensate drain issues. These systems will even send an alert if they have not had internet access for a prolonged period. The newly released NT-BAC/IP BACnet Gateway makes integration into existing BACnet systems a breeze. And integrating any NetworkThermostat solution into an existing system is simplified with an open API to speed development of the necessary drivers. Getting started is incredibly easy, and so are installation, schedule setup and management. Using a Net/X™ Energy Management System is truly a simple way to achieve dramatic energy savings, shrink your utility bill and give you a fast system payback. First, identify the quantity of Net/X™ thermostats and type of HVAC units in your existing structure or new building and decide if wired or wireless is right for your needs. Then, install the thermostats and connect them to your local area network. Finish out your installation using the Net/X™ Command Center software to create your schedules with just a few mouse clicks, and you’re done. The XBus (Wired) & StrongMesh (Wireless) are System Programmable versions that require a system coordinator (NT-IPXB) to store & push schedules to the thermostat. These solutions accommodate 7 day, 6 events per day schedules and multiple calendar based vacation schedules (Figure 2). No real time clock or schedule resides in the thermostat. The XBus and StrongMesh solutions are ideal for light commercial and large residential applications. For an XBus™ ‘wired’ network, simply install a CAT5 cable to each thermostat and connect them as far as 1,000 feet away from the Network Controller, with up to 4000 total feet of cable. For a StrongMesh™ ‘wireless’ network, add a Wireless Coordinator Module anywhere in the facility within 1,000 feet of the Network Controller. 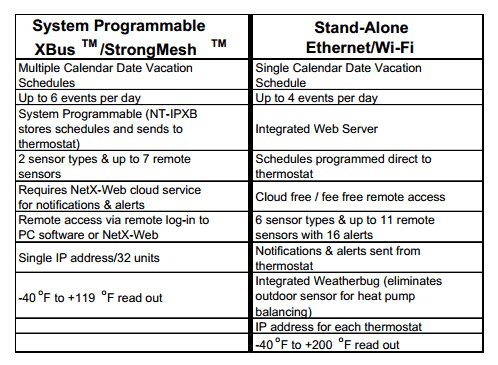 This module interfaces the StrongMesh™ versions of our thermostats to the entire network. Multiple Wireless Coordinators can be used on every Network Controller, if needed. Recently released are the Ethernet (Wired) & Wi-Fi (Wireless) Stand-Alone Programmable solutions with integrated web server and schedules embedded in the thermostat. These solutions accommodate 7 day, 4 events per day schedules and a single calendar based vacation schedule. No cloud or any associated fees are necessary to monitor and control these thermostats. The Ethernet and Wi-Fi solutions are ideal for residential, commercial and light industrial applications. Using our design team’s 40+ years of HVAC industry experience, we’ve put our knowledge to work for you. With universal equipment control for conventional and heat pump systems, in most cases your Net/X thermostat can be installed by simply matching the existing color-coded wires of your old thermostat. The Wi-Fi Connection Wizard allows simple connection to your existing network or run a CAT5 cable from the thermostat to your router for direct Ethernet connectivity. These options, alone or mixed on the same network, will deliver the flexibility that’s right for you. It all depends on your building’s best fit. Large or small, new construction, expansion or retrofit, a Net/X™ solution will solve your energy management problems quickly. A wired solution eliminates any RF related issues. The XBus™ only requires a single IP address & router port while the Ethernet solution requires an IP address & router port for each thermostat, which can be an issue with some IT departments. Both solutions are ideal for new construction or buildings with hung ceilings. A wireless solution eliminates the need to pull cables. The StrongMesh™ is a self-healing mesh network based on the 802.15.4 protocol. Every thermostat is a receiver, transmitter & repeater. The StrongMesh solution is more RF immune and secure than Wi-Fi and may be able to be used where Wi-Fi cannot. Wi-Fi solutions require an IP address for each thermostat, which can be an issue with some IT departments. It is also important to check Wi-Fi accessibility at each thermostat location to ensure a robust signal is available to guarantee connectivity. A cell phone can provide a good indication of Wi-Fi signal strength in an area. StrongMesh and Wi-Fi solutions are ideal for existing buildings or applications where pulling cable is difficult. For a more advanced energy management system, consider remote sensors for supply & return air, condensate monitoring, cooler/refrigerator/freezer monitoring, outdoor temperature sensing, and humidity sensing (Figure 3). You can even use wall or ceiling mounted occupancy sensors, with adjustable dwell time, to control HVAC in rooms that are sometimes unused. Occupancy sensors allow a room or area to be pre-conditioned and if no presence is detected within a preset time, the HVAC will revert to set back mode thereby saving energy and money by not providing an unused space with costly climate control. Round out your energy management system with a Net/X NT-RELAY Dual Electronic Relay solution to control lighting, set pump schedules, control outdoor signs or schedule and control any electronics with an on/off switch. A Net/X Energy Management System is flexible, powerful and economical. Monitoring and programming thermostats in a home can be tedious, in a modern commercial building it’s time consuming, and at multiple commercial location the task is nearly daunting. The Net/X Command Center PC Software Application (XBus & StrongMesh) and Net/X-IP Command Center Software Application (Ethernet & Wi-Fi) easily manage multiple thermostats and multiple locations from a single screen. The intuitive interface runs on any Windows platform from XP to Win 8 or any virtual machine using the same operating systems. The Command Center Application makes it possible to view all thermostats associated with a project on a single screen, making it easy to organize projects at one or multiple locations (Figure 4). For example school systems, manufacturers and restaurant chains can monitor and control the HVAC system for different buildings and even different locations. This feature is ideal for the vacation home, favorite retreat or any location with multiple HVAC systems. The Command Center view has the exact same look and feel as that served up by the embedded browser. A key feature of the Command Center PC Software is the ability to drag-n-drop copies of the parameters on any page to one or more thermostats. This simplifies programming each thermostat with the same schedules, configuration set-up, and date & time settings. The Command Center Application requires user log-in credentials providing electronic security while adding tamper-proof reliability to your HVAC settings. Use the secure Command Center software to set up passwords, permissions and configurations – then simply drag-n-drop these settings to the respective thermostats. Global functions facilitate setting vacation mode (or extended hold) on multiple thermostats at once as well as time and date synchronization and overrides. In addition to thermostats, the Command Center Software Application can be used for real time changes and the scheduling of NT-RELAYs (Dual Relay Programmable Time Clocks). Use NT-RELAYs for scheduling and controlling pumps, lighting, signs, or anything that needs to be switched on or off. The Net/X-IP Command Center can also configure alerts as well as notification e-mail and SMS destinations. Use the drag-n-drop feature to add the same alert notification and destination configurations to any thermostat in a project. The Command Center Software also includes a table view that shows all the thermostats assigned to a project with data in tabular format. Tables can be updated at any periodic interval as often as every 5 seconds. Table data is stored in .csv file format on the PC for each thermostat assigned to the project. An additional new file is created monthly allowing for data logging of HVAC environment parameters for many years. All data is simply imported into Excel or other graphing tools for easy analysis. A dedicated PC running the Command Center Software is recommended for logging data for analyzing HVAC trending. If you are in need of an energy management solution but can’t afford or don’t want to replace your current system with an EMS solution costing tens of thousands of dollars, then look to NetworkThermostat’s mini-EMS system in a box. Eco-friendly Net/X solutions save time, save energy and save money. They provide powerful double digit percentage savings on energy consumption, flexible integration of third party devices or integration into current EMS systems, and economic relief – a Net/X energy management solution can pay for itself in a single heating or cooling season. Headquartered in Grapevine, Texas, NetworkThermostat (Net/X) designs and manufactures cost effective electronic and software products meeting the needs for on-site and remote-location control for the heating, ventilation, and air conditioning (HVAC) market. Net/X's products place simple, user-friendly tools in the hands of residential, institutional, commercial, and light industrial customers. Since 1995, NetworkThermostat has been recognized as an industry pioneer and leader in cost effective networkable HVAC solutions. NetworkThermostat started with an innovative approach for simple, cost-effective, on-site and remote-location control for the HVAC Industry. The company designs and develops its own hardware and software products, partnering with a combination of multi-billion dollar global controls manufacturers for volume manufacturing. Net/X's proven technology and “HVAC Control Redefined…” approach is conquering both the inadequacies of standard thermostats, and the complexity of expensive and cumbersome building automation systems.